The Keys nightclub in Darlington, UK, needed an energetic, stylish lightshow that matched the old-school, disco-inspired theme of its stripped back décor. Management turned to Mike Stead of local sound and lighting supplier Phase One to deliver the goods using versatile moving heads and powerful strobes from ADJ! Owned by Mistell, a company run by Alastair Powell and his children Michael and Vicky, The Keys nightclub in Darlington, UK, is their latest project, joining two other venues based in the Tees Valley area of North East England. 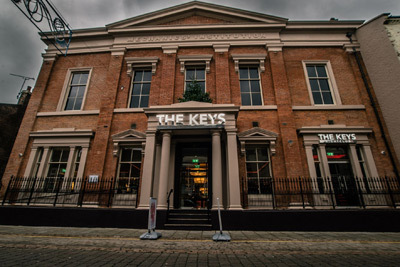 Rebuilt from the ground up to create an aesthetically pleasing new venue, The Keys contains an elegant ground-floor bar and a state-of-the-art upstairs nightclub, while the outside of the historic building keeps many of its original listed features. The décor looks great and so does the dance-floor, but Mistell knew that a state-of-the-art lighting setup was needed to really top things off, which is why they contacted Mike at Phase One. In this case, the equipment Mike and his team chose was an assortment of ADJ’s very best lighting products! This included eight ADJ Inno Spot Pros, each fitted with custom GOBOs bearing The Keys’ logo; 12 ADJ Inno Color Beam Z7s; and six ADJ FREQ 16s. It’s this mix of super-bright, versatile moving heads and intense strobing that keeps crowds at The Keys coming back time and time again. The ADJ moving heads enabled Mike and the team to really bring the dance-floor to life, with eight Inno Spot Pros delivering powerful moving beam effects in an array of colors. A highly adaptable fixture that’s ideal for switching between clean-white lighting and vibrant color beams, the Inno Spot Pro utilizes a powerful 80W white LED source and an independent color wheel housing eight colors, plus white. With 540-degree pan and 270-degree tilt, the fixture also enables the team at The Keys to cover the whole of the upstairs room, sending exciting beam effects zipping across the dance-floor and keeping them sharp and crisp thanks to the unit’s motorized focus. Enhancing these effects even further, the Inno Spot Pro features six rotating GOBOs, on a dedicated wheel, and a 3-fact prism. These GOBOs ensure that rotating and static patterns can be projected onto the dance-floor, walls and ceiling, allowing the custom-made ‘The Keys’ logo to be displayed around the venue for clientele to see while they dance and party! Due to having separate GOBO/color wheels, the dance-floor at The Keys can be brought to life using endless combinations of pattern and color, while the rotating 3-facet prism offers impressive spiralling effects that fill the venue with movement and color. Adding more movement to the mix, Mike and the Phase One team decided to bring in 12 compact Inno Color Beam Z7s, which offer the dual-functionality of wide-reaching wash effects and tight powerful beams. By utilizing seven 10W quad-color Osram Ostar LEDs and a variable 10-60° beam angle (thanks to motorized zoom), the Inno Color Beam Z7s can fill the upstairs room with smoothly mixed color, whether in the form of tight slicing beams or widespread immersive washes. Furthermore, versatile and rapid movement is offered thanks to 540° pan and 220° tilt, while 16-bit fine pan/tilt control enabled by stepper motors with micro-stepping allow the venue to be filled with fast-moving, but accurately positioned, beam effects and static washes from a range of positions. Able to generate atmospheric blues, reds and purples that bring a modern, chic look, the Inno Spot Pro and Inno Color Beam Z7 fixtures emphasize The Keys’ industrial features: the brickwork, exposed pipes, hanging lampshades and metal barriers that give the venue its trademark look. Working in tandem with The Keys’ weekly Clique night, which plays the best of R&B, hip hop and house, the lightshow and décor create an old-school New York disco vibe – topped off by the flashing, chequered LED dance-floor in the center of the club. The Keys also features a VIP room, with VIP drinks packages available – a popular aspect that’s complemented by the cool, laid-back atmosphere generated by the ADJ lightshow’s lush colors. Bringing additional energy to the venue, six ADJFREQ 16 Strobes were also installed, providing the intense strobing options enabled by the units’ powerful LEDs and 16-zone chase effects. With an ultra-bright source consisting of 16 white 5W LEDs and control options for strobe speed and 0-100% dimming, the FREQ 16 Strobes allow The Keys to bring eye-catching strobe effects that flash and chase to create a unique party atmosphere for its clientele. Despite the clear success of the lightshow, and indeed the venue, the project still provided Mike and the team with plenty of challenges to overcome. Working from scratch with a new venue that had a clear vision of what it needed was always going to offer up some issues, but Phase One were quick to resolve them. Whether in North Carolina or the North of England, ADJ continues to deliver pure lighting excitement to venues across America, Europe and beyond. It was a pleasure to join forces with Mike and the team from Phase One, who chose ADJ in order to help bring energetic moving beam effects, immersive washes and intense strobing to The Keys venue in Darlington, UK. Combined with the chic, New York-disco inspired decor, these versatile, powerful lighting effects created something truly special for the venue’s clientele, without the Mistell management team having to blow its budget. ADJ really does hold the key!